Type a brief description of what you want a function to do, and then choose Go. A list of functions likely to fit your needs and based on your description will display in the Select a function box. Select Most Recently Used. Functions you have inserted in the recent past will display in alphabetical order in the Select a function box. Select a function category. 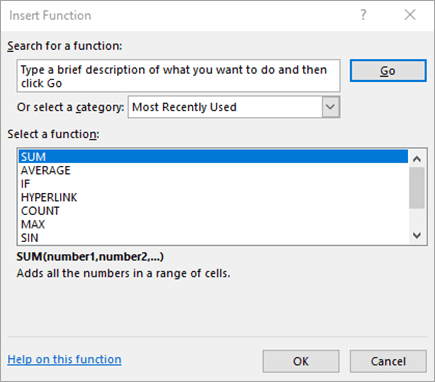 Functions in that category will display in alphabetical order in the Select a function box. Select All. Every function will display in alphabetical order in the Select a function box. Click a function name to see the function syntax and a brief description immediately below the Select a function box. Double-click a function name to display the function and its arguments in the Function Arguments wizard, which helps you add correct arguments. Displays the reference help topic in the Help window for the currently selected function in the Select a function box.